This program prints IP or internet protocol address of your computer system. 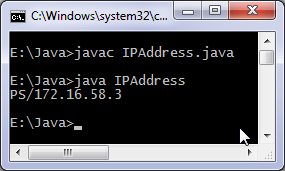 InetAddress class of java.net package is used, getLocalHost method returns InetAddress object which represents local host. Output of code prints computer name/ IP address of computer. Java has a very vast Networking API and can be used to develop network applications. his program performs garbage collection. Free memory in java virtual machine is printed and then garbage collection is done using gc method of RunTime class, freeMemory method returns amount of free memory in jvm, getRunTime method is used to get reference of current RunTime object. Obviously the amount of available after garbage collection will be different on your computer. Numbers are not important, what is important is that amount of memory available is more than before. You can use this code in your program or projects which uses large amount of memory or where frequently new objects are created but are required for a short span of time. 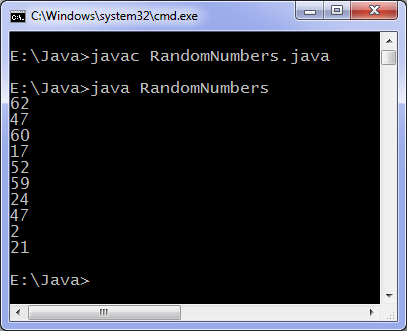 ava program to generate random numbers: This code generates random numbers in range 0 to 100 (both inclusive). Don't use Date and Time class of java.util package as their methods are deprecated means they may not be supported in future versions of JDK. 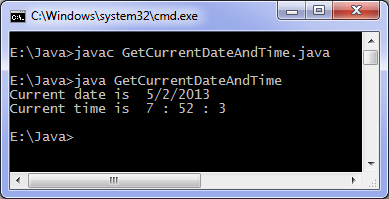 As an alternative of GregorianCalendar class you can use Calendar class. Java program to find substrings of a string :- This program find all substrings of a string and the prints them. For example substrings of "fun" are :- "f", "fu", "fun", "u", "un" and "n". substring method of String class is used to find substring. Java code to print substrings of a string is given below. For a string of length n there will be (n(n+1))/2 non empty substrings and one more which is empty string. Empty string is considered to be substring of every string also known as NULL string. Other methods of searching are Linear search and Hashing. There is a binarySearch method in Arrays class which can also be used. }binarySearch method returns the location if a match occurs otherwise -(x+1) where x is the no. of elements in the array, For example in the second case above when p is not present in characters array the returned value will be -6. Java program for binary search: This code implements binary search algorithm. Please note input numbers must be in ascending order. Java program for linear search: Linear search is very simple, To check if an element is present in the given list we compare search element with every element in the list. If the number is found then success occurs otherwise the list doesn't contain the element we are searching. This program compare strings i.e test whether two strings are equal or not, compareTo method of String class is used to test equality of two String class objects. 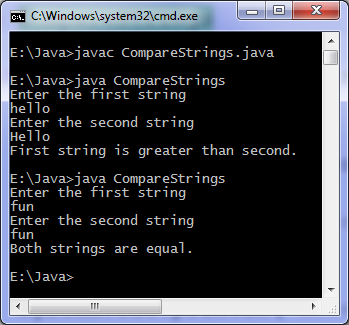 compareTo method is case sensitive i.e "java" and "Java" are two different strings if you use compareTo method. If you wish to compare strings but ignoring the case then use compareToIgnoreCase method. String 'hello' is greater than 'Hello' as ASCII value of 'h' is greater than 'H'. To check two strings for equality you can use equals method which returns true if strings are equal otherwise false. }Both the above code consider a string as case sensitive, you can modify them so that they are not case sensitive.